Gingerbread-based budget smartphone also sports a 2 mp camera, expected to be available in retail soon. UPDATE: The Micromax Ninja4 A87 is now available online at this link. 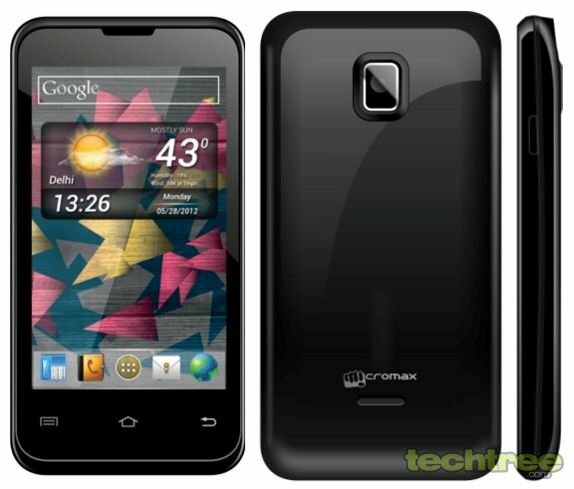 If you thought that Micromax was done with its current smartphone-launching spree, you are sorely mistaken. The Indian mobile brand, which is loved by some for its cheap phones and hated by others for its alleged lack of quality and customer support, has introduced a new GSM dual-SIM handset, called the Ninja4 A87. The manufacturer seems to have cottoned onto the fact that a significant percentage of the Indian public seems to like smartphones with big screens regardless of the other specifications, and is now hell-bent on catering to this market segment. Dual-band 2G (900, 1800 MHz), 3G (WCDMA 2100 MHz), Dual-SIM. 2 megapixel fixed-focus rear camera. 100 MB storage, 32 GB microSD card slot. Wi-Fi 802.11 b\g\n, Bluetooth 2.1, Assisted GPS, USB 2.0. FM radio, 3.5 mm jack, gyroscope. Li-Ion 1400 mAh battery with talk time of up to 5 hours and standby time of 175 hours. 4.9" (l) x 2.5" (w) x 0.5" (11.7 mm) (d). Available Colours: Black, White, Black & White. Package contents: charger, battery, headset, and user guide. While it may not be too different from its similarly-priced sibling the Ninja2 A56, a 4" phone priced at Rs 6000 doesn't sound like a bad deal at all, even if it doesn't run the latest Android 4.0 (Ice Cream Sandwich) or have dual-SIM capability. If you'd rather check out the phone before rushing to buy it, look for a store in your city. The product wasn't available in online stores at the time of filing this report, but you can expect it to show up in a day or so. Would you buy a phone if it had a huge screen at a cheap price, regardless of how bad or outdated the other specs were? Let us know in the comments.